“Ordinary Day” is still #1 on the listeners’ voting charts on Croatia’s largest radio station Otvoreni Radio, but the song has just moved up to #2 on the station’s airplay list — meaning that the song is the second most-played track on the station. Meanwhile, the song is #28 as a new entry on Radio Cibona, Croatia’s 3rd largest station. You can vote to push the song up both on Otvoreni and Cibona. In the Middle East, “Ordinary Day” is #10 on the charts on NRJ Lebanon. Thanks to DMode, Sabina, and Leandro. Radio101 in Croatia playing more songs from AYL? If someone can confirm this — including which songs titles are being played — use the links below to email us and let us know! Dolores O’Riordan is “calling Croatia” in a big way this week, as her new single “Ordinary Day” has quickly jumped to #1 on Croatia’s biggest rock station, Otvoreni Radio. Otvoreni Radio was also the first station in the world to play the single. Dolores has currently topped The Killers, Nelly Furtado, Kylie Minogue, and Timbaland. Voting is open to everyone, and you can help keep Dolores in the #1 spot by voting here (click on her name). It’s only 1 click and very easy. You can also vote for Dolores on Radio 101 (click checkbox then “Glasaj”). Thanks to DMode for the news. Dolores O’Riordan has already recorded the music video for her debut single “Ordinary Day,” her MySpace reports. Dolores O’Riordan’s O cial Website has launched at http://www.doloresoriordan.ie — currently the site contains an updated tour date list, a clip of “Ordinary Day,” and confirmed worldwide release dates for Are You Listening? If you still have yet to hear Dolores O’Riordan’s debut solo single “Ordinary Day,” you can now listen to it in full on her MySpace profile. 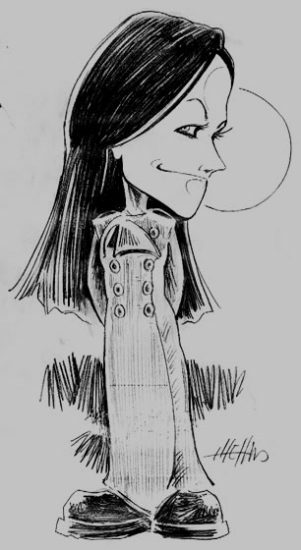 Italian cartoonist theHand (alias Maurizio di Bona) told us in the ZG Forums that he “felt some scribble coming out” after gazing upon the cover of Dolores O’Riordan’s solo album. theHand, you’ll recall, designed a line of o cial merchandise for The Cranberries’ last tour in 2003 and recently released a compilation book Scarabocchio Ergo Sum that includes those works. Here’s what he came up with…. You can post feedback in the Forums! Dolores O’Riordan’s o cial MySpace page has launched, complete with a full English biography and profile image. Needless to say, you can become a friend if you haven’t already! The update reveals a number of tidbits about the album: First, Are You Listening? is due in Japan and Australia on May 21. Second, Cranberries live guitarist Steve Demarchi’s brother Denny Demarchi has a number of contributions to the album, including: Keyboards, Guitars, Flute, Wind instruments, Backing vocals. Dolores O’Riordan – songstress, smoldering icon and critically acclaimed voice of The Cranberries – is back. Her first-ever solo LP Are You Listening? is released on Sanctuary Records, May 15th and features the stunning new single “Ordinary Day.” Co- produced by Youth, Dan Broadbeck and engineered by Rich Chycki, the eagerly anticipated album is a 12-track tour de force and marks her first release in four years. Gaffa confirms that Dolores O’Riordan’s concert in Copenhagen will take place at the Vega on June 11th. Tickets will go on sale at 10:00 on February 26 from Billetlugen.dk. If you are skilled in the Danish tongue (Google Translate won’t help us), you can read more details over at Gaffa. Universal Music is releasing another budget-priced “greatest hits” collection for The Cranberries in the UK, this time a DVD title called The Cranberries: The Videos, which will be part of their Gold Collection series. Thanks to many for the tip. Dolores wrote over 30 songs for Are You Listening? Static Multimedia has posted what appears to be a Sanctuary-penned synopsis of Dolores O’Riordan’s forthcoming solo album Are You Listening? The press release reveals that the singer has written over 30 songs over the past five years, only 12 of which appear on the forthcoming album. This extreme sort of “boiling down” of songs seems to fit in with the direction that O’Riordan was heading when she was starting to write The Cranberries’ ill-fated sixth album in 2002. Also, it should be pointed out that “Apple of My Eye” appears as “Apple” in this press release. Three adjectives that can be used to describe both album and artist. 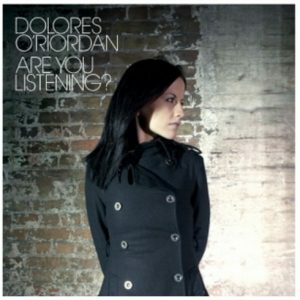 Sanctuary Records is thrilled to release Dolores O’Riordan’s first solo e ort, ARE YOU LISTENING? on May 15, 2007. Taking her time after the demise of The Cranberries (who sold 40 million records worldwide), Dolores O’Riordan retreated to real life with her husband. She had three children and wrote over 30 songs. She never rushed. And when she was ready, she whittled those 30 songs down to the terrific 12 tracks that make up ARE YOU LISTENING? A logical successor to The Cranberries, but a knowingly more mature e ort, ARE YOU LISTENING? takes the listener on a journey of the heart. From the rage of “Black Widow,” to the sweet romance of “Apple” to the joy of first single “Ordinary Day,” O’Riordan always was – and remains – one of the few vocalists that can capture emotion in a song. It comes down to the voice. THAT voice. You know just where you were the first time you heard “Linger” or “Dreams” or “Zombie.” That power remains intact when hearing ARE YOU LISTENING? Dolores O’Riordan is one of a handful of artists who can be identified from the second they sing their first note. Co-produced by Youth, Dan Broadbeck and Rich Chycki, ARE YOU LISTENING? is a stunning debut from an artist who really has nothing to prove but everything to share. Thanks to celticyodels for finding it. It appears that some venues still have yet to be confirmed. “Ordinary Day” single on May 4th, Are You Listening? album on May 11th. Thanks to Stéphane for the news! Confirmed: A PR representative for Sanctuary Records has confirmed to Zombieguide that Dolores O’Riordan’s Are You Listening? is now scheduled to come out on May 15th in the United States. Thanks to Meg for the news. Amsterdam’s Paradiso is listing a Dolores O’Riordan concert scheduled there for June 3rd at 20:30 local time. Tickets will go on sale March 3rd. This is earlier than the first-announced June 6th date in Paris, so perhaps more even earlier dates are soon to be announced. Thanks to our tasty friend Taco for the tip. UK ticket broker Ticketweb has posted a second tour date for Dolores O’Riordan’s summer tour: London at the Koko on June 15th at 7 PM. Tickets are not yet on sale, but will go on sale on Friday, February 23rd at 9 AM. Helter Ltd., Dolores O’Riordan’s self-owned management company, has just registered the domain http://www.doloresoriordan.ie, presumably for use in promoting her upcoming record. The domain record was most recently updated on February 15th. There is only a generic placeholder page there currently. Thanks to Saeed for pointing it out. Sanctuary Records has sent out a French press release, which includes the title of a song called “Watch the Stars,” which was not included in the recent full-album promos for Are You Listening? It could end up as a B-side — we’ll have to wait and see. The press release also says that the 2 songs that UK-based Youth produced are “Apple of My Eye” and the first single “Ordinary Day.” Additionally, mixer Richard Chycki has updated his blog to report that he and Dolores co- produced the single. Chycki writes that Dan Brodbeck and Dolores O’Riordan co-produced most of the album. Conçu entre son Irlande natale et le Canada, sa terre d’adoption, « Are You Listening ? » marque le grand retour et les débuts solo de Dolores O’Riordan ! Enfin libérée de toutes obligations contractuelles et de ses inhibitions, après quatre ans de silence, celle que l’on a connue comme LA chanteuse du groupe irlandais The Cranberries, revient sur le devant de la scène, seule, plus envoûtante que jamais, avec un disque chargé d’émotions pures. Très largement inspirées par les expériences personnelles de cette musicienne hors pair, les 12 chansons de ce disque traitent de sujets forts comme le cancer qui a emporté sa mère, tristement dépeint à travers la sombre métaphore de « Black Widow », ou plus heureux comme les rapports avec son mari canadien sur « Apple » ou de la naissance de Dakota, leur troisième enfant, avec « Ordinary Day ». A noter que deux de ces titres, « Apple » et « Ordinary Day », le premier single, sont produits par Youth, dont l’on a déjà pu apprécier le travail d’orfèvre avec The Verve, Embrace, Primal Scream, U2 ou Paul McCartney. Il y a fort à parier que le scintillement crescendo des guitares rock de « In The Garden », les touches délicates et les refrains accrocheurs de « Watch The Stars » ou « Loser », ne vont pas manquer de séduire tous ceux qui ont un jour vibré pour les compositions et la voix cristalline de la chanteuse. A noter que c’est le bassiste Marco Mendoza (Blue Murder, Thin Lizzy, Ted Nugent, Whitesnake, Soul Sirkus) qui accompagnent Dolores sur disque et sur scène ! le 6 juin à Paris, au Bataclan. The photos were taken at Pulse Studios and Windmill Lane Studios (where The Cranberries recorded To the Faithful Departed and Wake Up and Smell the Coffee), both in Dublin. There are also photos of guitarist Steve Demarchi, bassist Marco Mendoza, and drummer Graham Hopkins, who are all contributing to the album. A photo shows that for one take, the crew had to squeeze Graham Hopkins’s drum kit into a tiny voiceover booth at Windmill Lane Studios. Another photo shows Hopkins sitting at a mixing board listening to a recent take, while others are scenic pictures of Howth outside of Dublin, where Dolores now lives. A MySpace page has launched for Dolores O’Riordan’s solo album… but there really isn’t much there yet. There’s a rough biography about Dolores’s collaborations from 2003 to the present, which should be well-known to Zombieguide readers. Of course you can get in line for the friends list, although no one’s been approved yet. Update: Although the profile is linked to Sanctuary Records, the page says it is a fanpage at this time. Right alongside today’s unveiling of the cover of Dolores O’Riordan’s solo album is the announcement of the first concert, to be held June 6th at the Bataclan in Paris, France. 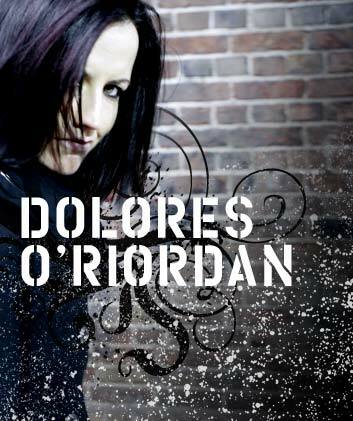 Provided that no earlier concerts will be announced, this will be Dolores’s first full-length concert in nearly four years, her last being The Cranberries’ summer tour ender in Killarney, Ireland, on June 27, 2003. More tour dates are sure to come soon, so we’ll have them up as soon as they’re announced.